(Sept. 24th, 2011) — Do you know what it is like to paint? Moving your brush across a canvas making whatever you can imagine with as many colors as possible. This is how you play Pixel Junk 4 AM. I’ll get to that confusing description in just a moment, and I may not be able to explain it any better than I just did. The game was playable for the first time ever at the Fantastic Fest Arcade 2011 this past weekend, and we have a video of our walk through demo with the Lead Designer on the game after the break. Rowan Parker was on hand to walk me through the game. He is the Lead Designer on the project and he had flown all the way in from Tokyo to Austin to show off the game. At first when you look at the screen it looks like nothing more than what you might see in the visualizer in Windows Media Player. Parker explains to me that while the game is simple in approach, it is a very deep experience. He is correct about that. Q-Games is known for their ability to always come up with some ingenious way to twist a tried and true game genre. Pixel Junk Monsters made tower defense games popular on consoles, and Pixel Junk Eden was a refreshing take on the traditional platformer. I told Rowan how much I respected and admired Q-Games for being so innovative with the Pixel Junk series, and how I’ve loved what they’ve done with the last two Star Fox games. (Command, and 64 3D) He tells me that I appear to know more than the average person attending the show that day. I’m flattered. After some pleasantries we dive right into Pixel Junk 4 AM. 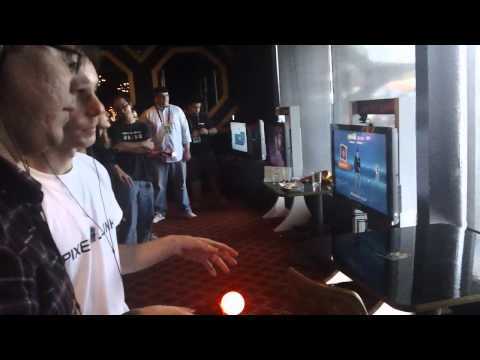 You play the game with a Playstation Move controller. Each of the four face buttons represents a different instrument track, like the kick drum. The Move button enables a effect for the currently select instrument. There are a total of 4 different instruments that will make two different sounds depending on whether you swing the move controller up, down, left or right. These four different instruments each have an effect that when implemented, can make an additional two sounds other than the instrument itself. The effects add some cool flare and spice up the interactive musical canvas. To begin you select an instrument and hold down the T button and throw the track at the screen. No music is playing up until this point and the only thing happening on screen is some lines or shapes floating around aimlessly. Once you active all 4 instruments you can really get some interesting beats going. You can turn off any effect, or any instrument at any time by double tapping the corresponding button. It is a surreal experience. I can’t say I was playing a game. Rowan goes out of his way to point out to me that they didn’t want the player doing what they game told them to do, they wanted the player to tell the game what to do. It will really is an open ended game with endless possibilities. There will be different visuals on the screen for different tracks and stages. It’s very hard to describe, even the video we recorded of us playing the game can’t really explain what the main draw of the game is. You really can’t put down the controller as the game is always surprising you with something new. It is easily the best use of the Playstation Move controller that I’ve ever seen, and one of the few games that really distinguishes the Move controller from the Wii Remote and shows its more sophisticated tracking of the Move controller in 3D. Rowan tells me that the game will be recording you as you make music, and that you will become a DJ through this game. Players will be able to download a free, separate application that will allow you to listen to other player’s creations whether you bought the game or not. So not only will you get the most creative use out of your Move controller, you’ll get some solid tunes to jam out to. The music for the game is being provided by the same individuals responsible for the music in Pixel Junk Eden, so the soundtrack is sure to be relaxing while at the same time uplifting. I couldn’t get a release date on the game, but it can’t come soon enough. I stress that you find a way to play this game when it comes out, by any means necessary. This is what motion control games should be about. Not shoe horning in the obvious sports and shooters that people expect from developers, but truly captivating ideas like those found in Pixel Junk 4 AM. Xbox Live Update arriving November 15th, more than likely.